Screwing with pets is fun. They are furry and cute but despite what your ex-girlfriend used to go on and on and on about, they really aren’t that smart. Case in point is the laser game where any seemingly sane cat or dog can be sent into a frenzy over a quickly moving dot of light. Endless fun can be had watching their minds break as they hopelessly chase something they cannot physically grab. This is why humans rule the earth. We should stop showing our children movies where animals talk and are smart, because we are just setting them up for disappointment. The pet Laser Dazer is a fun project that can be done with the Vision Tracking Starter Kit or the Desktop RoboTurret (need to pick up the laser separate.) 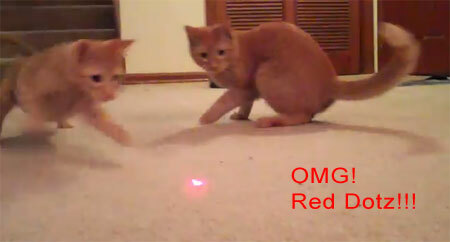 The concept is simple, take the age old game of “catch the laser dot” and add robots to the mix! It even works with kids. Watch the end of the video to see Andrew’s daughter throw herself against the wall in excitement. See, robots ARE fun people. 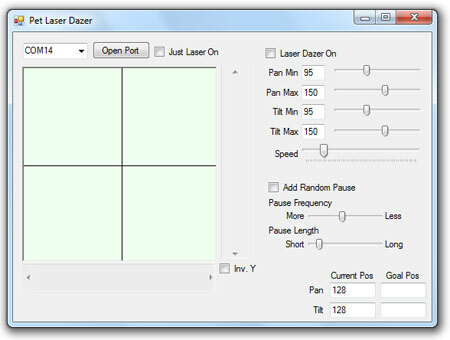 Laser Dazer Demo App can be found here. This entry was posted on Monday, December 13th, 2010 at 3:20 pm	and is filed under Featured Projects / Robots, Front Page News, Fun Stuff. You can follow any responses to this entry through the RSS 2.0 feed. You can leave a response, or trackback from your own site.